I can’t remember why but I had a surplus of spinach to use up. Normally I turn to Indian recipes for spinach but I fancied something a bit different this time. This is very loosely based on a recipe from Cranks Fast Food but I changed the spices and the method to make it quicker. What resulted was an extremely quick and tasty dish. I served it alongside some cooked bulgar wheat with fresh coriander stirred through it. Heat the oil and cook the red onion and garlic. Add the spices and fry for a minute or two. Add the red pepper and the chickpeas, including a few spoons of the liquid. Season with salt and pepper and cook for about 5 minutes. Then add the spinach – it will take up the whole pan but will soon wilt down. Then add the tomato and chilli, cook for a few more mites, then finish off by adding the soy sauce. 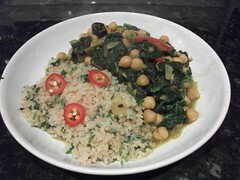 I love spinach with an Arabic twist!